I bought a jar of this cult classic face cream to try out a couple of weeks ago. I was standing in the chemist feeling rather overwhelmed by the vast array of facial products staring back at me, when I noticed this unassuming little package on the shelf. I decided that this was the product I was going to take home with me, based on it’s simple packaging, small price tag and cult status. My grandmother is a huge fan of Nivea Crème. She’s been using it for as long as I can remember, and she has gorgeous skin. My grandmother is a very fussy woman when it comes to beauty products, so the fact that she’d been using this cream for such a long time was a good sign. I have to say that I am very, very impressed with this product. I’ve been using it for about four weeks now, and it has had a remarkable effect on my skin. The crème itself has a rather thick texture. It’s much thicker than any face cream I have ever used before, and I was a bit dubious about how it would work with my rather oily skin. The crème is quite thick and it does take a bit of effort to smooth it into your skin. The extra work is definitely worth it though. Once the crème has sunk into your skin, it has a soft, silky texture. It is intensely moisturizing, and quickly perks and plumps dry skin. I used it religiously when I had a cold a few weeks ago, and it stopped my poor nose from drying out, even with all the nose-blowing I had been doing. My skin is also rather sensitive, and this crème didn’t aggravate my skin or make me break out. Even though my skin can be on the oily side, the Nivea Crème doesn’t leave my face looking like an oil slick. It sinks into the skin well and doesn’t leave a lot of greasy residue. It is fantastic underneath makeup, as it helps my foundation to glide on easily. I have found that if I’m wearing a liquid foundation, I need to apply a little translucent powder over the top, because my face can get a little shiny. The Nivea Crème is ideal for applying underneath mineral powder foundation, as it helps the product to adhere to my face better, so it lasts longer. The crème also gives the face a dewy glow when worn under mineral foundation. 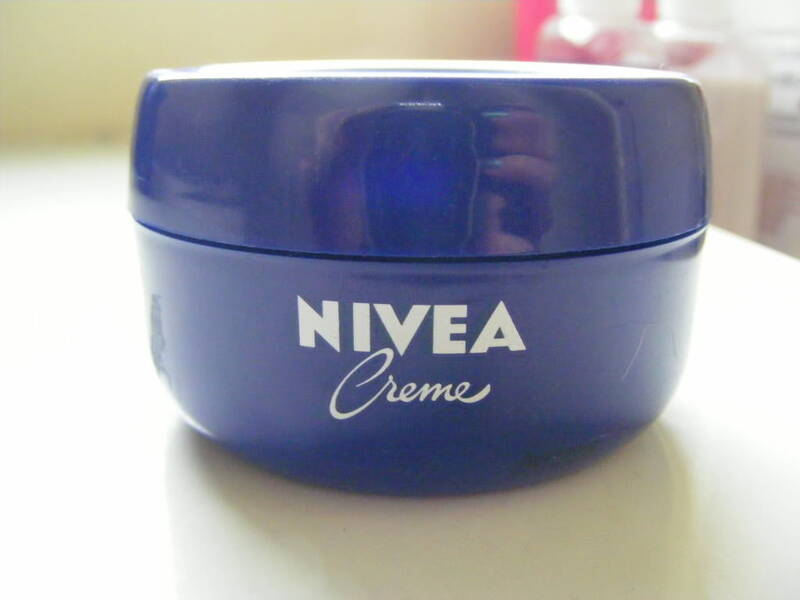 The Nivea Crème comes in a simple, navy blue jar. I prefer face creams that are packaged in jars, because it’s easy to control how much you use, and there’s no wastage, because you can get to every last drop of product. The cream has a light, classic scent that is sweet but not overpowering. The smell of this reminds me of staying with my grandmother, because she used this product religiously. This product is also excellent value. I purchased my jar for just $6.95 at my local chemist shop, and I estimate that the jar will probably last me five months of daily use. I am very impressed with the Nivea Crème. It will be perfect for the cooler months, when my skin tends to dry out with the harsh, windy weather. I would highly recommend it to anyone that has dry or sensitive skin. It is perfect for daily use or for giving your skin an intense shot of moisture. Nivea Crème is a great product for ladies with a tiny beauty budget, as it costs about the same as a Happy Meal and is infinitely better for you. I can’t say enough good things about this product. I’m totally hooked. My skin is full of oily, can nivea control it, can I use this as a daily cream. Hmmmm, I wouldn’t recommend this for oily skin. It is very heavy and thick and might be too much for skin that is already oily. Instead, I’d use a lotion that has a lighter texture rather than a thick creme. Hi…can i use nivea creme on acne prone and oily face? Hmmmm, If your skin is acne prone I wouldn’t suggest using this creme. It is very heavy and may overwhelm your stressed out skin. Instead, I’d recommend using a lighter, fluid lotion to moisturize your face. My current favourite is the Olay sensitive facial lotion. It’s perfect for skin that is oily or prone to acne. Is it really safe for oily skin? And can I use it just after washing my face, without using toner? Also, how did you do your own website? Sorry for the random stuff but thank you! It’s definitely safe for oily skin, and you could certainly use it without a toner. If you’re worried about it being too heavy for your skin, you could try using it as a night cream, and then use something lighter for daytime under your makeup. No need to apologise! I use WordPress to create my website. They have lots of great templates and it’s super easy to use. is nivea naturally even God for black skinned? Hmmmm, I’m not sure. I have quite pale skin and it smooths on evenly for me. However, it is rather thick and the cream has a white hue to it, so it might leave a bit of residue on darker skin tones. I have dark skin but it does not leave white marks. I just get a pea size then run it in between my fingers until the white color is gone and I gently pat it on my skin. Thank you so much for this comment Princess Iris! This answers the previous commenter’s question perfectly. I have dry skin and I use MAC Studio fix foundation. But the foundation makes my skin really dry, especially around the mouth and chin. You have mentioned that you use this as a make up base, I wanted to be ask you how? I mean, should I use the moisturiser first, then primer (I use Revlon Photoready Primer) and then follow up with the foundation? Hi there. Thank you so much for your question. To use this as a base for my makeup, I wash my skin and then apply the cream, making sure to rub it in carefully. I’d leave it a good 10 minutes before applying primer and foundation just to give it a chance to sink right it. I was about to ask the same question, i never thought nivea creme can be used as make up base. Id love to give it a try! I’ve used a couple of the Nivea sunscreen products and I really like them. The Nivea Face Veil was my go-to facial sunscreen for years, and I would definitely recommend it. Hello! Im just wondering if when do you use it? Like do you use it as your night and day moisturizer? I was using it as my night cream, as I found it a little bit heavy for daytime. But if your skin was very dry, there is no reason why you couldn’t use this during the day. Hi I just want to ask if what is the right way to use nivea creme because I am using it right now but when I applly it on my face my face is so shiny I also tried to wash my face after applying it. Hope you can help me because I dont really know the right way to use it I just want to use it like a moisturizer without washing it. Thanks a lot. Thank you for your question. Nivea Creme is quite a heavy moisturizing cream. To use it, you would apply it after washing and toning your face. However, it does have quite a shiny appearance after application. If your face is quite shiny after application, it may be that this cream is too rich for your skin type. You may want to try a lighter formula, such as a facial lotion rather than a creme. Just want to ask, what soap do u use for your face, ive been using kojic soap and it seems like its harsh on my face. And, do u have to use a toner before applying moisturizer? Thank u very much. At the moment I’m using two different cleansers. At night time I use a home-made cold cream and in the morning I’m using a Pears oil-free face wash.
It’s really up to you whether you want to use a toner before you apply your moisturizer. I think it’s a good idea because it helps to get rid of any grime your cleanser may have missed, and it helps your skin to absorb your moisturizer. If you’ve got sensitive skin, a toner with a rosewater base would be lovely and soothing. Im looking all over Nivea websight and it doesn’t tell me the difference between the Nivea moisturizing ani-wrinkle day cream / or night cream.. why would someone need both? Im not a makeup person but have used Nivea all my life (but now Im older thought the ani-wrinkle would be good to start. I got the day care one (but didn’t know if I should be switching between the night also).. probably a stupid question but didn’t know who to ask?? Hi there! I don’t know for sure about the difference between the Nivea products, but in general a night cream will be richer and more hydrating than a day cream. Day creams are likely to be lighter in texture and may also contain some sort of sun protection. If your skin feels well-hydrated and you feel like the day moisturizer is doing it’s job, I don’t see any reason why you need to double up on products. However, if you think you might need an extra dose of moisture at night, I’d recommend snapping up the night cream. Thanks so much for replying to me so quickly..
No worries! I’m glad I was able to help. Thank you for this in depth review. I am literally leaving to the drugstore right now to get a new moisturizer since I can’t afford to get my Estée Lauder one. Definitely considering this as my grandmother has used this all her life too. It’s a brilliant product. I can’t recommend it highly enough. I’m glad you enjoyed the review. I love Nivea Creme as well, great review! Thanks. theme/design), I don’t have time to go through it all at the minute but I have bookmarked it and also added in your RSS feeds, so when I have time I will be back to read a great deal more, Please do keep up the great work. Thanks a bunch! It’s always great to hear positive feedback.